Eurocom is launching a newly designed and developed, high efficiency 780 Watt power supply / AC/DC Adapter. This AC Adapter/Power Supply was developed to power high performance laptops that Eurocom specializes in, such as the Sky X9E2 and Sky X7E2. A variety of other laptops can also be powered by this AC adapter. This high efficiency AC Adapter can be applied to a variety of high performance applications, where high efficiency, highly mobile, rugged power supplies are needed. For workstations, desktops, small form factor PCs and servers it is highly advantageous to have the AC adapter outside of the enclosure to reduce heat and increase performance of the system. Up until this point Eurocom customers have used a dual 330 Watt AC Adapter solution to power certain high performance configurations. We, in part, developed this solution to give our customers a single solution for increased mobility and convenience. To complete the Eurocom tradition of providing as much performance and innovation as possible to our customers we also included several features that are not found in typical power supplies. 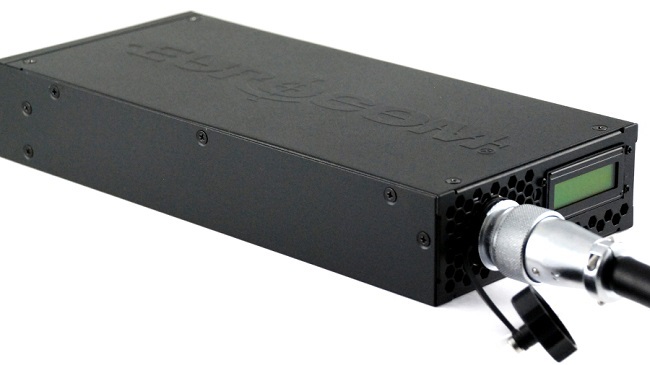 These include the LED display, detachable/removable DC cable with screw locking mechanism, detachable/removable AC cable, power switch, auto switching capability, industrial grade chassis design and dual high speed fans for thermal management. The 780 W AC/DC adapter is equipped with two high speed fans and ventilation ports to manage the thermals of the internal components of chassis. “We are very pleased to finally be able to offer this innovative solution to our customers who have been demanding a high wattage, high efficiency AC Adapter for their multitudes of uses, while being extremely light and mobile for those on the go.” Mark Bialic, Eurocom President. Having this AC Adapter outside of a server or workstation chassis allows for lower heat inside of the enclosure, leading to longer life span of internal components. “this product supports all Clevo and MSI notebooks that use the four-conductor DIN-type connector. With plans to offer a variety of removable cords with different connections at the laptop end, this product has potential to become an item of interest for all high performance notebook owners.” Brenner Fox. An LED display gives users a real time breakdown of the amps, volts and wattage being utilized. A metal powder coated enclosure provides a simple yet classy exterior that won’t feel out of place in your home or office. •	The efficiency (watts out / watts in) higher than 90% typically while measuring at nominal line and maximum load. •	The range of input voltage is from 90Vac to 264Vac. •	The maximum input current is 10A at AC Input 100Vac/60Hz. •	The inrush current will not exceed 100A at 230Vac/63Hz AC input for a cold start at 25?. •	The Power supply power factor at full load operation shall be more than 0.9 at 230Vac input.